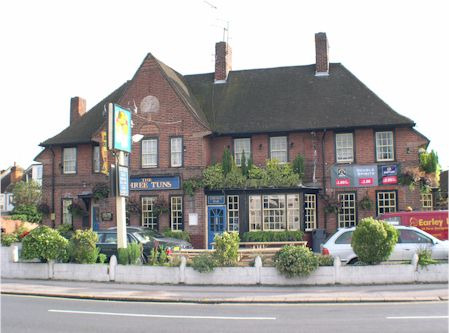 Located two miles from Reading town centre The Three Tuns is a recently refurbished modern traditional style pub in a local community with two seperate bars and beer gardens consisting of The main bar and Lounge Bar. Lounge bar: The lounge bar is a comfortable little bar with a 60 capacity (extended to 120-150 with marquee which we have) with low volume background music no machines and suitable for small to medium sized functions or events or a great place to meet your friends for a few drinks or a fantastic casual dining experiance. This bar also has 1x 42" plasma screen that can be for used media presntations or for big sporting events for comfortable relaxed viewing. The main bar: This bar has just been fully refurbished and is 100 capacity with 47" 3D and 42" Plasma screens. This bar is for general use and a night out at the local pub feel. We also hold live music events and other events in this bar and can also be booked for larger functions. Everyone is welcome in both bars for a great day or night weather eating or just drinking and enjoying yourself. Contact The Three Tuns directly or use our simple contact form.